An early printable so everyone could get a head start on putting these together and actually I'm quite excited about them! It's February and it's the month of love. What's more appropriate then giving a special someone a valentine filled with sweets? Download the printable here. There are four different designs on one sheet. Best printed on 8.5 x 11 matte photo or heavy cardstock paper. Below's a little tut just in case. Cut the valentines out. If it's printed on matte photo or heavy cardstock paper, lightly score the lines with an exacto knife. This makes it easier to fold. Fold the tab and the half line. Glue the tab. Press firmly and wait for it to completely dry. Squeeze the valentine open. Fold down the flaps on one end. It should fold down easily, especially if you scored it. If you need to you can glue or tape this end so whatever you put in it doesn't fall out. 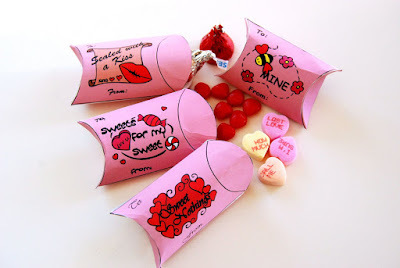 Fill the valentine with your favorite Valentine's day candy. Fold down the flaps to enclose. A little gift for that special someone! Enjoy!! Sweet idea for v-day!!!! Thanx for sharing. Oh no way, these are ADORABLE! Thanks so much for sharing, I'll be linking to this. i set a link to your post at my blog. i hope you'll agree. if not, please lease a comment. Oh my god!! You're famous!! Love your printables. Thanks so much for sharing, I downloaded your Valentine candy boxes. I have done the same thing for my Oatmeal, because I love lots of nuts and dried fruit in my oatmeal, more than the commercial packaging provides. The only difference is I use freezer paper and iron the sides closed. Freezer paper can go through an inkjet printer, but never put it through a lazer printer.